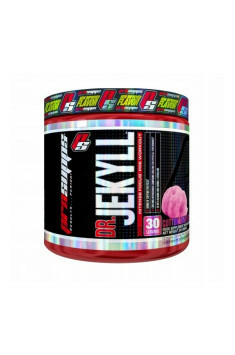 PROSUPPS Dr. Jekyll is a pre-workout supplement containing beta alanine, creatine monohydrate, glycerol monostearate, L-arginine alpha-ketoglutarate, L-citrulline, glucuronolactone, N-acetyl L-tyrosine, L-ornithine hydrochloride, taurine, beetroot powder, betaine hydrochloride, caffeine, choline bitartrate, and inositol. The supplement enables an improvement of individual parameters of physical capacity and better effectiveness of the workouts. Training is a physical activity performed for a specific purpose. The most common reasons for getting interested in physical activity is to improve health or athletic performance. The effectiveness of the activities taken up depends on the type of training effort, frequency, and duration of the sessions and training loads. The result of the regular physical activity is an improvement of the individual parameters of physical capacity, cardio-respiratory health, muscular strength, and endurance as well as body composition. Thanks to specially selected ingredients, the preparation allows an increase of the parameters of physical performance, and thus influences the effectiveness of the activities taken up and sports benefits. Proper motivation and strong focus are the basis for an effective training. The product contains the substances that allow an improvement of concentration and building up a mental attitude to take up an intense physical activity. These substances include inositol, which supports the balance of brain chemical compounds affecting the mood, such as serotonin and dopamine, choline bitartrate increasing the availability of acetylcholine, which is an important neurotransmitter increasing mental energy and concentration, and N-acetyl L-tyrosine, responsible for limiting fatigue and increasing readiness for taking up a physical effort. Appropriate stimulation is a key element of the preparation for a training, and a factor which determines its intensity and the ability to perform it without efficiency drop. The preparation was enriched with a carefully selected dose of caffeine, which is a psychoactive stimulant that eliminates the signs of fatigue and improves reflex and concentration. Creatine monohydrate increases the body's ability to regenerate ATP, the main energetic compound, the proper production of which stimulates the increase of strength during intense resistance exercises and sprints. The taurine contained in the preparation acts as a creatine transporter to the muscles, which results in an increased effectiveness of the use of taurine by the body. Beta Alanine is a component of carnosine that buffers the pH drop associated with the formation of lactic acid in muscle tissue during an exercise, so it can increase muscle endurance and reduce physical fatigue. Beetroot powder found in the preparation contains nitrates, which dilate blood vessels. Arginine alpha-ketoglutarate and L-Citruline, which increase the production of nitric oxide (NO), have similar properties. The intensification of the muscle pump effect is not only a visual effect that makes us want to train harder and longer. The relaxation of smooth muscles in the blood vessels wall causes that a greater amount of blood flows through the muscles, leading to their better nourishment and oxygenation. The addition of glycerol monostearate causes the water to retain within the blood vessels resulting in the intensification of the muscle pump. Intensive physical activity causes the body to accumulate harmful metabolites that prevent the continuation of the series and even the entire training session. One of them is ammonia, which affects the deterioration of cognitive abilities and muscle fatigue. L-ornithine HCl contained in the preparation increases the urea cycle, through which it promotes the removal of ammonia and counteracts the negative effects of its accumulation. Glucuronolactone is a common component of energetics, which by participating in the excretion of toxins supports the process of removing the metabolic products produced during the performance of intense physical efforts. A pre-workout meal should abound with easily digestible sources of protein because the availability of free amino acids during a workout protects against muscle catabolism. Betaine HCl contained in the preparation improves the process of protein digestion and assimilation of the nutrients from food, including amino acids. In summary, PROSUPPS Dr. Jekyll is a pre-workout diet supplement that improves the body's ability to perform intense physical exercises. Supplementation with PROSUPPS Dr. Jekyll increases energy levels, enables better focus and also increases muscle strength and endurance. The preparation delays the moment of psychophysical fatigue, allowing for increased intensity and duration of the training sessions, as well as increased training loads. Take 1 scoop 15-30 minutes before training. Depending on the individual sensitivity to pre-workout preparations, we recommend using doses adequately matched to the needs. Therefore, during the first contact with the preparation, it is advisable to reduce the dose by half. The size of subsequent portions should be adjusted to the individual tolerance and strength of impact on the body. Flavoring, anti-caking agents (calcium silicate, silicon dioxide), acid (citric acid), sweetener (sucralose), soluble corn fibre, colour (allura red). Beta alanine ethyl ester - by esterification of the amino acid-protein (beta-alanine) increases the bioavailability of the active substance, increasing the rate of synthesis of carnosine (beta-alanyl-L-histidine), substances with antioxidant potential of the buffering and chelating properties. Thanks to the buffering properties, carnosine reduces the concentration of hydrogen ions and increases exercise capacity (strength and endurance) and influences the biological regeneration after exercise. In the sports supplementation it is recommended for athletes practicing strength, endurance-strength and endurance workout. It is a component of the advanced creatine stack, and nitrogen boosters. Dosage: 2-4 g per day, before anf after the workout.